When my mum was young, footloose and fancy-free, i.e. before I came along, she travelled. 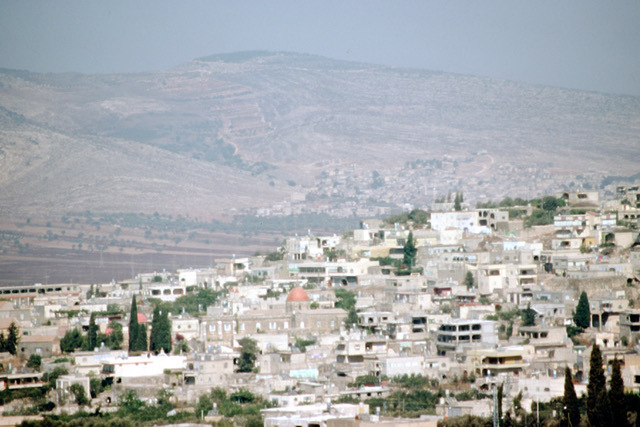 One of her trips to Europe included a visit to Israel. There she picked up a couple of soulful souvenirs—tapestries of two Chagall Windows. The Windows are a set of twelve created by early modernist artist Marc Chagall for the Hadassah University Medical Center synagogue. Mum didn’t get around to completing her tapestries, so roughly thirty years later I volunteered to take the needle and this is what I learnt along the way. In 1959, Dr Mariam Freund (President of the Hadassah) and Joseph Neufeld (the architect of the medical centre) commissioned artist Marc Chagall to create stained-glass windows for the synagogue. Each of the twelve windows was inspired by one of the twelve tribes of Israel. 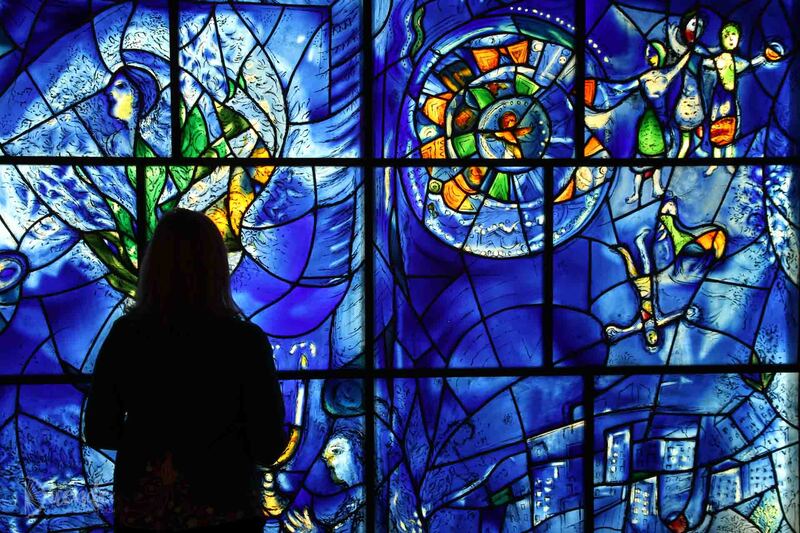 The artist spent two years working on the project and the completed Chagall Windows were exhibited in Paris, and New York before they were permanently installed at the Medical Centre in 1962. I remember seeing the tapestry (technically needlepoint) canvases in a cupboard as a child. Even more so, I remember seeing the bag of colourful embroidery thread that accompanied them. It was the colours that first drew me into Chagall’s work. He is often said to have crossed Fauvism, Cubism and Symbolism. It was the Fauvists, “wild beasts” like Henri Matisse, who used vivid and unnatural colour in their work. Chagall chose the dominant background colours of each window based on bible verses describing Jacob blessing his 12 sons and Moses blessing the twelve tribes, which mentioned gold, blue, purple and scarlet. A few years ago, mum considered giving away the needlepoint canvases which she never found time to start. I ignorantly volunteered to do them – oh boy! I cannot tell you how long it took me to finish the first one, it would be in the realm of 3years. I would work on it in fits and spurts as I found renewed inspiration to tackle those tiny stitches. I didn’t realise how much detailed black outline there was to complete – I much preferred working on the colourful parts of the design. There would have been even more black outline had Chagall’s assistant, Charles Marq, not developed a special process of applying colour to the glass so that three colours could be used per pane, rather than the traditional technique of separating each stained-glass piece with a strip of lead. I was so relieved to get through the first one, I hesitated to take on the second. Then I saw the first beautifully framed and I decided the second had to be completed. But I procrastinated for at least a year before starting… I wasn’t ready to place that first stitch. I knew once I started, it had to be completed—for my own satisfaction at least. In that year’s “break” we relocated from Singapore to the U.S.A. There isn’t any better motivation to take up an indoor project than a Midwest winter, let me tell you. Still I procrastinated. Then during that first year living in the US, I visited New York City for the first time and went to the Modern Museum of Art where Chagall had exhibited the windows before they were installed. I saw my first Chagall artwork face to face there. You can read more about Chagall’s I and the Village in my Art Highlights of New York City post. I also saw the murals he created for the Metropolitan Opera House, installed in 1967, though I was somewhat distracted by the crystal Sputnik chandeliers. I was buoyed for a while and made a start on the second tapestry… but my motivation faded again. Then I began to read about Chagall and learnt that tapestries were one of the many mediums he worked in besides painting and glass – although he only designed the tapestries and employed specialists to create them. Chagall created book illustrations, stage sets and ceramics. Again I surged forward before motivation petered out. Almost another year passed. We went to Chicago and there in the Institute of Art, I stood in front of Chagall’s America Windows. The six panels of luminous blue glass debuted at the Art Institute in 1977. The windows came about because Chagall had gone to Chicago in the early seventies to create The Four Seasons, a mosaic located in front of the Chase Tower. The Windy City showed such enthusiasm for his tiled work that Chagall offered to create windows to commemorate America’s bicentennial. The windows celebrated America’s cultural and religious freedom through the arts (Jewish Chagall fled Europe for the USA during WWII). The glass works depicted music, painting, literature, theatre and dance. If you’ve ever seen the movie Ferris Bueller’s Day Off, you’ve seen the windows even if you didn’t realise it (2min scene below). Finally, I had the inspiration to complete the second window! You really have to stand in front of these glass artworks to understand how ethereal and beautiful they are. They are every bit worth recreating stitch by stitch. I also added the Chagall windows at the Hadassah Medical Centre to my art bucket list. UPDATE: As of November, 2018 the second tapestry is complete and has been safely delivered to Australia. I’ll post photos of both windows here once the second is framed and on the wall. What creative project has your travel inspired you take on? Tell us in the comments below.